We provide you the best GoPro products at the best prices on the web. Take a look at our categories on the left for the widest range available, and shop online safe in the knowledge that all orders are 100% secure - guaranteed! The Go Pro Hero 4 is one of our best sellers and comes in 3 additions. The hero silver 4 has a touch screen which the others do not this lets you see what you are recording but makes no difference if you are mounting the camera. The hero 4 black edition has no screen but can shoot 4k at 30 fps where the silver hero can only manager 15fps at 4k. 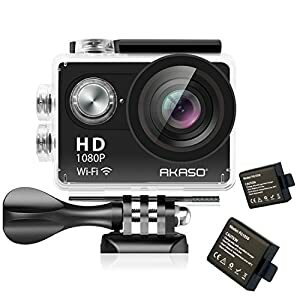 The battery life of the cameras is about 1 hour 15mins of continuous recording at 4 k and at 4k 15 mins of recording will use about 5GB of storage so don’t forget to pack extra memory cards for your trip. The audio is better on the go pro hero 4 compared to the 3. And the smart screen on the silver can be used to line up shots. The battery is no on the bottom and goes in vertically. At 1080 p the difference between the cameras can’t realy be seen it is not until you get to 4k that the camera quality difference can be seen. They both have low light modes and a night lapse feature they are an improvement on the 3rd generation. The cameras on night lapse realy don’t show much difference at night between the two cameras. The sound on both the black and silver is about the same and both can record polyphonic sound well. The dynamic range is good on both cameras, if you want good sound you must have the built in mic exposed or use and external one. If you are looking to make professional 4 k films the black edition is the one to go for, but for home use the silver will be a more user friendly option. The black can have a screen attached as an extra. The basic go pro hero 4 sould not be considered unless you have a very tight budget.